When you walk into the Kitchen Designs & More showroom at Waterway Shoppes II in Weston, you will find displays featuring quality cabinetry styles and craftsmanship, along with a variety of eye-catching and unique designs. 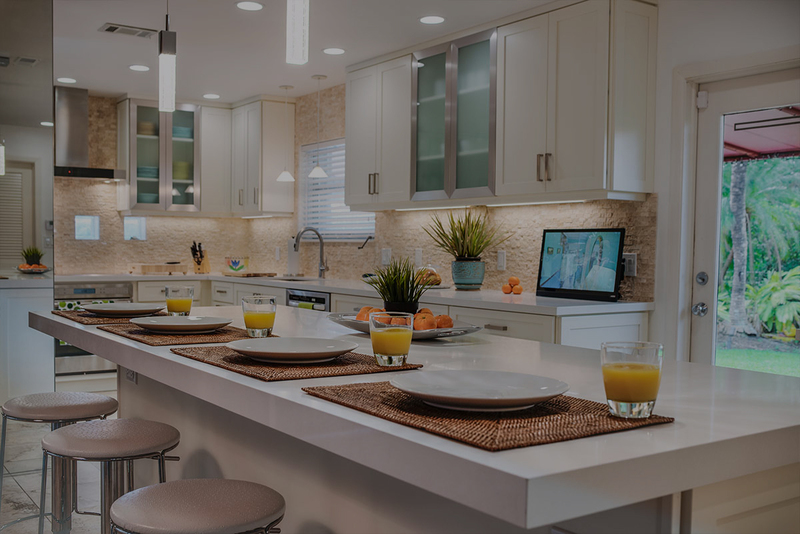 Owners Nora and Elliott Landman want to give their customers the best value possible when it comes to enhancing the beauty of the home through the latest trends in kitchen and home design. We’ve distilled our interior design process into 4 Steps – the same steps we have been using for more than 41 years. We meet our clients in their home, discuss their ideas and the scope of their project, and take all necessary pictures, references, and measurements. Based on what we discussed during our initial meeting, KD&M will create a full proposal, including a completed design of the project, itemized proposed quote, and a proposed day-to-day schedule for the project. After having the opportunity to go over the proposal, KD&M listens to and applies feedback to an updated design and proposal. Once the design and schedule are finalized, all materials are ordered and the project is officially underway! KD&M is Weston’s source for Design, Cabinetry, Granite, Natural Stone and Porcelain flooring, and much more. We specialize in Kitchens, Bathrooms, Wall Units, and Libraries. Kitchen Designs & More specializes in: Interior remodeling, Lighting design, Library design, Custom wall units, Floating vanities, ‎Custom Renovation , Shower enclosures, Bath tub remodeling, Enclosed bathtub, Glass enclosed bathtub, Glass shower doors, Electrical services, Faucets for kitchen sink, faucets for bathroom sink, Glass vessel sinks, Scheduling kitchen remodel, Quality kitchen cabinets,(natural) Stone flooring, Stone backsplash, Stone countertop, Limestone flooring, Stone tile, Travertine tile, Home Improvements, Porcelain tile flooring, Wood grain porcelain tile, Wood look tile installation, Onyx countertops, ‎Kitchen Renovations ,onyx for kitchen, custom Maple, cherry cabinets, Cabinets made in America, Outdoor kitchens, Kitchen layout ideas, Home bar designs, Wine rooms, Handles for cabinets, hardware in the industry, Kitchen cabinet, bathroom cabinet handles and knobs, Medallion Cabinetry dealer in South Florida, Broward custom kitchens, Quartz countertops, Glass mosaics for backsplash, shower accents, Shower tiles, Bath tiles, Glass tile backsplash, Mosaic back splash, Stainless steel tile backsplash, Subway tile back splash, Glass subway tile backsplash, stone tile backsplash, hardwood flooring, Country kitchen, Wood veneer cabinets, Cabinet installation, Modern faucets, Modern bathroom, Contemporary floors, Cabinet installation, Kitchen cabinet installation, Bathroom cabinet installation, Granite Countertops and ‎Marble Floors. We service the following locations: Weston, Davie, Plantation, Southwest Ranches, Sunrise, Pembroke Pines, Fort Lauderdale, Ft Lauderdale – Broward County, Broward, South Florida, South FL.